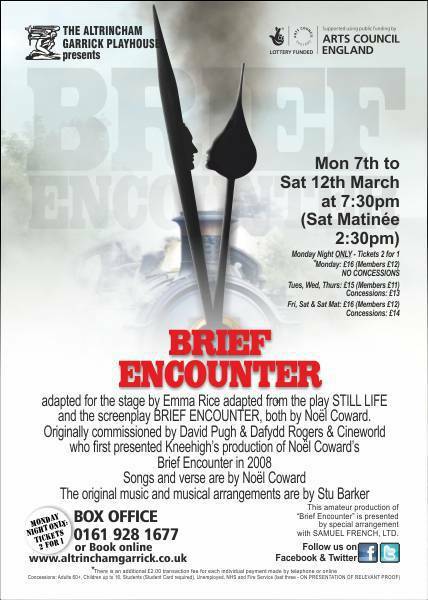 and the screenplay BRIEF ENCOUNTER, both by No?l Coward. Noel Coward’s famous film (1945) is remembered as one of the most haunting and moving love stories ever. Now thrillingly adapted for the stage by Emma Rice, this award winning version has been lovingly received on both sides of the Atlantic. When Laura accidentally meets a doctor, Alec, at a train station, the initial reaction is just that, but then after a few more meetings, the two fall madly in love. But Laura is married with young children and desperate feelings of loyalty, passion and yearning almost tear her apart. Coward delicately points up the trials and tribulations that marriage can bring, and like the ocean hitting the rocks, Laura and Alec are swept away into something uncontrollable. In this brilliant version, the plot is brought to life by a wonderful visual theatricality – a truly memorable and unpredictable stage experience. WHENEVER Barry Purves directs a production, I always enter Altrincham Garrick with all the eagerness of a child bounding down the stairs on Christmas morning. You never know quite what to expect with BP, other than the unexpected, of course. So it is with Brief Encounter, which he’s also designed, and the end result is an evening that is both all seducing as it is deeply moving. It feels like a play, a?musical and one of those old-fashioned films they used to put on, usually on wet Saturday afternoons when I was a child. My only criticism is the music detracted from the dramatic impact of the boat?rowing scene involving the nice doctor Alec (Paul Wilson) and Laura (Sarah Roberts), a woman unfulfilled by her domestic purgatory. Paul is suitably gallant as Alec and there’s an endearing chemistry?between him and Sarah. You are certain to find yourselves aching for?a happy?ending. There are other fine performances to enjoy from the consistently impressive Alison Davis as Myrtle, who runs the station caf? which doubles as a hot bed of romance. As Beryl, Myrtle’s gossip devouring waitress, Fiona Primrose is quite exceptional. This is comedy acting of the highest order. Brief Encounter transports us back to more innocent times, when a station master was still a figure of authority. While Alec is every inch the gentleman, the quintessential English gentleman, he certainly isn’t slow at coming forward when it comes to the ladies. A must see, for romantics and cynics alike.